The case: It is best when some secrets remain hidden and some stories remain untold. But is destiny too kind to let this be? A strange Y-shaped symbol in the sky terrifies a mysterious, alien race living secretly on Earth for centuries, and changes forever the fate of five human beings; a Brazilian street fighter, an American cop, a Chinese karate instructor, a Russian environmentalist and an Indian ad maker. Meanwhile, a geek in NYC is amazed to see his dreams grow more and more bizarre each day and meets an angel who isn’t conventional in any way. This is the story of how their destinies intertwine. They could have had heaven but they did not take it. The demons were against them, and so were angels but that did not scare them. Destiny had already ruled against them but they chose to rebel. Embers of Light is the story of five ordinary humans who chose the path of light over and above everything else … even GOD. The author: Abhishek Gupta did his graduation from Delhi College of Engineering and post-graduation, in management, from IMI Delhi. He specializes in branding, qualitative market research with a short stint in advertising. Also he had free-lanced for Random Magazine, the first humour magazine of India. He is an idealist who loves creativity and enjoys laughing. The review: Being a die-hard fan of the world of fantasy, I was very eager to lay my eyes to this thriller from the moment it arrived at my doorstep. But, as they say, when you like something it is hard to really give yourself to it, hence my case. I struggled to read this book, owing to the busy schedule, and thus the late review. ‘Embers of Light’ is a kind of literary piece that takes you to an overall new world that you wouldn't have even dreamt of; yes it’s the dreaded ‘Paataal’ that I’m talking about. The story starts with five ordinary human beings, as mentioned in the blurb, being selected to arrive at the doorsteps of the alien power, Vashis. But why are they the ‘chosen ones’ amongst others and the motive behind amazes the reader. With your eyes glued to the fantastic language used, the story starts unfolding about the two brothers, Zeeyan and Shaurya, and you end up feeling like you’re none other than one of the characters so beautifully portrayed by the debutant author. The story tries to depict the fight between two brothers, one who is said to be a Devil and another one, well you can guess it. Hence, it makes you have an in-depth knowledge of the skills of warfare, which the characters have to use for the awaited fight and more about themselves, and of course the others’. Another remarkable point I would like to mention about the story would certainly be the character of Nicklaus which has been captured so beautifully and yes, interestingly. Though an Indian reader who isn’t a hard-core fantasy fan doesn’t get to understand too many characters in a tale as this, but when the author makes efforts for the same, you can’t ignore it. Similar has been the case here. The characterization of each and every individual has been done in a very captivating way, such that neither the readers are confused, nor bored. The climax is a thriller for the readers and keeps the impetus on, but if anyone is a Dan Brown or a Harry Potter reader like me, maybe that person wouldn’t find it that exciting. 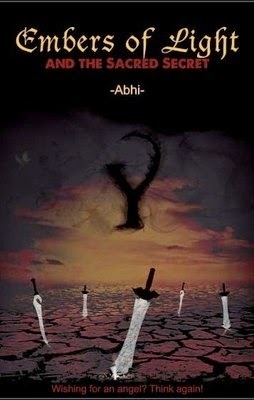 But when it is well-known to you that first time, an Indian author as young as Abhishek himself has tried his hand on a genre like FANTASY which is quite uncommon and unexplored in the present world of rom-coms and chick-lits, your face automatically tends to lit up, for you can’t compare a debutant with the legend, right? The verdict: Thus, thus, taking all points in consideration, there’s no denying to the fact that Abhishek, as a debutant has done an incredible task of penning down a story that has everything ranging from suspense, to research, to twists and turns, to goose bumps, to imagination, to a faultless good-over-evil battle, and lastly perfection.